Our corporate logo is Shadowman and the accompanying “Red Hat” wordmark. Shadowman is a symbol from our early days, when our founders embraced our outsider, subversive, revolutionary reputation and ran with it. Part superhero, part private detective, Shadowman was the guy in the red hat, the one who could help you with your computer. Shadowman represents our history of doing the right thing, and the confidence that brings. 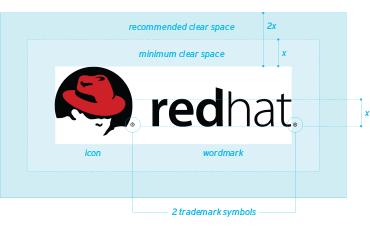 We never say never, but Red Hat very seldom approves the use of the Shadowman icon alone, without the wordmark. When we do, there is always a very good reason, considered and sanctioned at the highest levels. The reason for this is simple: we never want to miss an opportunity to say who we are. We’re pretty protective of Shadowman and our logo. Why? Because as an open source company, our trademarks are the most important intellectual property we own. By using our logo consistently and correctly, we make sure it’s protected and will serve us well for years to come. When we place other design elements too close to the logo, it can suggest a relationship between them. For example, placing a headline or phrase like “the open source leader” near the logo implies it is a corporate slogan. It isn’t. A registered trademark symbol (®) should always accompany both Shadowman and the Red Hat wordmark. When placing the logo on color, strive for maximum visibility. On light backgrounds, use the standard logo with black type. On darker backgrounds, use the reverse logo with white type. Use the full-color logo whenever you can. When that isn’t possible, use the one-color version. When using the one-color logo, Shadowman’s face and hat are always the lightest color available. That means that if the background color is lighter than the color of the logo, you should use the standard one-color logo. If the background color is darker than the color of the logo, use the reverse one-color logo. The rule above applies for special processes like embossing, engraving, and frosting, too. Think about which will be darker when the piece is finished—the background or the logo—and choose the best one-color logo for the job. When this silver portable charging device is etched, the etched area is darker than the base material. That means Shadowman’s hat and face should be the base material color, and the one-color standard logo is used. This black pen is etched to show the lighter metal surface. That means Shadowman’s hat and face should be the lighter metal color, and that the one-color reverse logo is used. Don’t stretch or distort the logo. Don’t resize parts of the logo separately, or move them around. Don’t crop the logo or Shadowman. Don’t change colors—the hat is red. The type is not. Don’t remove the ® (there should always be two), change the size, or move them around. Don’t stack Shadowman on top of the wordmark. Don’t attach product names or logotypes to the logo. Don’t attach taglines to the logo. Don’t make Shadowman’s face transparent. Don’t use the wrong one-color logo. Don’t use the one-color logo in a color other than black, white, or gray. Don’t use the wordmark alone. Don’t use Shadowman alone without specific approval from the Brand Team. Don’t break the logo apart or use the hat by itself. Don’t use the legacy JBoss logo to represent our middleware products. Don’t use Tux the penguin. He’s the mascot of Linux, not Red Hat. Tux should never be used in Red Hat or partner marketing materials. And never put a fedora on a penguin, a dolphin, or anything else. Shadowman hates that.